This week I want to talk about a great community on Captiva Island. It's called Sunset Captiva and it includes about 55 homes. This community has a pool, two tennis courts, deeded beach access and dockage on the bay side of the island. Currently there are two homes for sale in Sunset Captiva - a 2 bed, 2.5 bath for $669,000, and a 3 bed, 2 bath for $795,000. 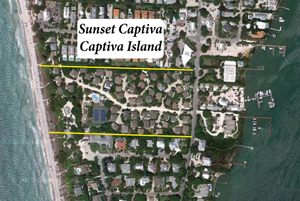 You can check out more about Sunset Captiva on My Webpage, and even watch a virtual tour of the property. There are always opportunities on Captiva Island and you can contact me for more information! Captiva Island offers lots of things to do! Many of the area's most famous restaurants are on Captiva. The Mucky Duck, The Bubble Room and the Olde Captiva House just to name a few. Captiva also has west-facing beaches which give you an incredible sunsets every night! Check out my Welcome to Captiva video and Captiva webpage for a great Captiva tour! If you don't have your own boat, Captiva's four marinas offer boat rental, fishing/shelling guides, sailboat charters and larger tour boats. The back bay fishing is world famous and will give you a memorable day on the water. Restaurants located on our out-islands are always worth the trip! Captiva also has some of the best shelling and beach fishing. Blind Pass Bridge, the short bridge from Sanibel to Captiva, is a popular place for shellers to search for that perfect junonia. You can walk the beach for miles, all the way from the bridge to South Seas Resort on the northern end of the island. Our real estate inventory is great and this is the year for you to take some time and consider Sanibel real estate or Captiva Island real estate. Give me a call at 239-691-4915 or use my contact form for all the latest real estate information! Whether you are ready to buy now, or just want to get familiar with our islands, I can help! I'm a long-time island resident and I'm ready to work with you to find just the right property!